Last month’s launch of Chatter introduced a social layer to Salesforce.com’s cloud-based CRM offering, but how far will businesses go to let customers have their say? Back in 2005 way before blogging became micro-blogging in what seems like another age, cartoonist Hugh MacLeod drew a seminal picture on the back of a business card. 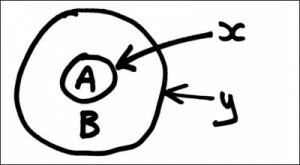 The diagram represented why blogging was good for business, by poking a hole in the membrane that separates a company’s internal conversation about its products and services from what’s being said in the real world. If you’ve not read Hugh’s post on the subject, I’d highly recommend it. Hugh’s point is that if a business’s internal conversation about its products and services is very different to what its customers are saying out in the wild, there’ll be trouble. Customers and businesses need to be closely aligned – talking to each other. Since 2005 the conversational, ‘social’ aspects of the web have arguably become its most potent meme and evolution of recent years. Thousands of companies large and small, from computer giant Dell to Herefordshire-based organic gardening retailers Wiggly Wigglers, have embraced social media as a way of conversing with their customers. Salesforce.com – control or conversation? Unsurprising then that last month in San Francisco the ‘software is dead’, CRM revolutionary, Marc Benioff should unveil a ‘social’ layer to Salesforce.com in the form of Chatter. Put simply Chatter is a Facebook and Twitter for behind the firewalled garden of business. A way to let staff, projects and even business processes talk to each other in real time. A business life-stream behind a thick skin. More porous, however, is Salesforce’s Service Cloud 2 which is where the real ‘social’ action is. It helps businesses to absorb knowledge and conversations on Facebook, Twitter and other online communities about their brands, products or services, attempting to make customer service more responsive and informed. So far so conversational, but interaction with the customer or the consumer very much remains in control of the business. It’s all about managing customer relationships, not about letting customers manage their relationship with your business. And here’s where the next revolution could take place. Vendor Relationship Management (VRM) is CRM flipped to give customers power and more importantly possession over their own digital data, identity and friends. Espoused by Cluetrain author Doc Searls and others, VRM is initially a little hard to get your head around in terms of how it might work in practice. But a good summary can be found at London-based VRM Hub. To take one practical example, imagine you as a customer having control of all the data relating to all the purchases you’ve ever made online, whether at Amazon or eBay or Ryan Air. Add to this a complete record of your search history for particular products or services. This is valuable data and it’s your data. A digital footprint of your own interests, habits and online behaviour. Data many a business would find incredibly useful in terms of really understanding what you wanted from them. If customers were in control of this information, they could selectively turn access to it on or off for certain brands they were interested in, depending on their personal privacy preferences. They’d be in control of the relationship with the vendor. In return for allowing access to this data they might receive special offers or information they really valued. Gone would be the broken model of poorly targeted, patronising advertising – replaced instead by a more mature exchange between equals. One of the issues with VRM is where and how individuals would store their online activity data, like e-commerce transaction history and then technically how, if they chose to, would they release access to it. This is where one could see a company like Salesforce.com creating a new customer-centric, cloud-based service. A VRM platform free to individuals, derived from yet to be agreed open standards. As long as it ensured complete privacy and portability combined with rock solid guarantees that individuals retained ownership of their data, such a platform could become a practical way of allowing customers to manage their relationship with brands. Why would Salesforce.com want to do this and do it for free? Because such a service would add value to what it already offers brands in terms of letting them better understand and engage with customers. VRM might sound like sci-fi – a concept developing in some far off geek galaxy. But for companies large and small, it may well prove to be at the centre of a much more sophisticated, grown-up and efficient way of doing business on the web.